Being an American, though born in Russia, I am used to road trips and big spaces and never-ending highways. In Ukraine there is not really such an infrastructure of highways and freeways as we have in the USA. Most roads connecting cities are relatively slow to travel on. Add to that the relatively crazy local driving habits, and overnight train becomes a very nice proposition for travel between cities. 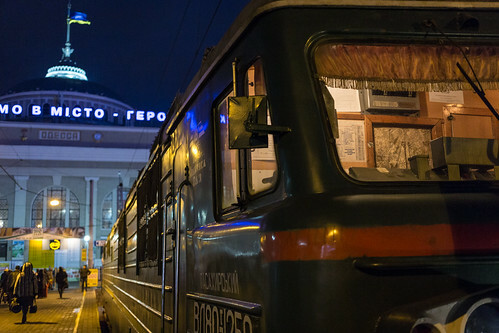 Pictured here is the train by which I arrived to Odessa in the early morning, just before sunrise. I had my camera handy and really liked the lighting inside the train with the backdrop of the main train depot in Odessa. Those who have traveled throughout Europe are probably a lot more familiar with traveling by train than us Americans.